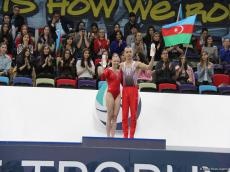 The awarding ceremony for the AGF Trophy, the special award from the Azerbaijan Gymnastics Federation, was held as part of the FIG Artistic Gymnastics Individual Apparatus World Cup in the National Gymnastics Arena in Baku, Trend reports. The AGF Trophy was awarded to gymnasts Jade Carey (USA) and Konstantin Kuzovkov (Georgia) for the highest executive score. The award was presented by Nurlana Mammadzade, Secretary General of the Azerbaijan Gymnastics Federation.